We offer the chance to be part of an amazing team training and performing together, it can either be for a recreational hobby or for the truly committed competitive level. Cheerleading is a performance based sport that combines elements of gymnastics, dance and acrobatics. A cheer routine incorporates dance, jumps, tumbling, stunts, pyramids and basket tosses that are performed together in a highly spectacular and energetic routine for 2 minutes 30 seconds. Cheerleading is the ultimate team sport, as it relies on every member of the team to be successful, resulting in developed confidence, coordination, trust and team work. 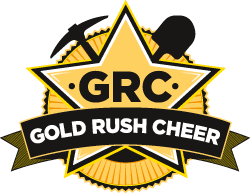 Cheerleading encourages team spirit and team camaraderie like no other sport, and promotes fun, fitness and friendships at a recreational level all the way through to a competitive level.